Saint Joannicius was born in Bithynia about the year 740. His father was named Myritrikes and his mother Anastaso When he had reached maturity, he excelled in soldiery and was counted worthy of royal honours for his bravery. He had been brought up an iconoclast, but while yet a soldier, he was converted to Orthodoxy by a certain holy elder. He later forsook all things and departed for Mount Olympus, where he spent the remainder of his life in asceticism. Becoming great in virtue, he reposed in the Lord in the year 834, having lived some ninety-four years. To this Saint is ascribed the brief prayer, "My hope is the Father . . . ."
We the faithful on this day all come together, righteous Joannicius, to keep thy sacred memory; and we beseech thee to intercede that we may all find great mercy with Christ our Lord. 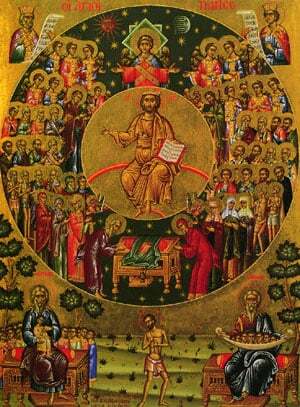 Share the feast of Joannicius the Great with an icon greeting ecard.